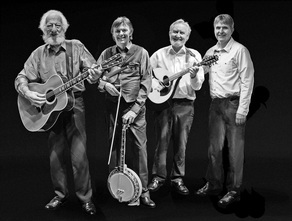 Last night was a big night for The Dagenham Roundhouse; not only did the iconic venue officially re-open as a concert venue for the first time in 30 years, it also had The Dublin Legends (formerly known as The Dubliners) appearing in front of an audience of over 300 eager fans all ready to celebrate the re-opening in true Gaelic style on this St Patrick’s weekend; a perfect combination and one that George Hands, the new owner and investor of The Roundhouse, must have been rubbing his ‘still sticky with paint’ hands together for. In the past The Dagenham Roundhouse was a pub and music venue which was originally established in 1969. From 1969 until 1975 the Roundhouse was considered to be East London's premier rock music venue. Some of the artists who appeared there in its heyday, include Uriah Heap, Queen, Status Quo, Led Zeppelin, ELO, Genesis, Thin Lizzy, T. Rex, Yes, Dr Feelgood, The Kursaal Flyers, Fleetwood Mac and even Elton John. Officially opened last night by Dagenham Councillor, Darren Rodwell, who explained that the reason the audience could possibly still smell a whiff of paint was because George and his team were literally working their socks off in order do complete the painting of the venue that very afternoon just before they opened their doors to welcome the community into their new abode. The venue is really just like a large community hall with half of the venue decked out with chairs with a bar at the back which is raised to overlook the main space and which, unlike a lot of venues these days, sells alcohol at very reasonable prices - always a bonus for those of us who enjoy a few bevvies! Fortunately for The Roundhouse, Dagenham hails a strong community spirit and the Irish community play a big part in that. They were clearly all out on Saturday night to celebrate with what is probably the most well known Irish bands ever, The Dublin Legends, unmistakably justifying their name. Although now no longer calling themselves The Dubliners after losing a few band members along the way, the fact is plain and clear to see - they can still deliver the same enjoyment they have given to their fans over the years, not just with their music but with their easy-going witty banter which instantly endears you to these great old guys who have clearly been there, seen it and done it over the years. 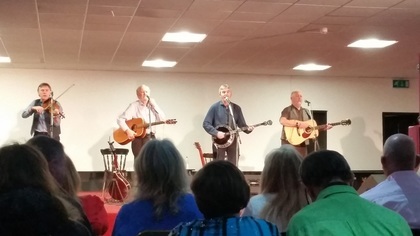 The Dublin Legends came on to a most appreciative crowd and performed over 23 of their songs with a twenty minute break in-between. They got the crowd going with songs like ‘Tell My Ma’ and ‘Black Velvet Band’ and Gerry O’Connor expertly showed off his banjo playing skills with a wonderful tribute to their now departed band member, ‘Banjo Barney’ McKenna, with some pretty nifty finger work. They also had the crowd cracking up with Sean Cannon’s rendition of ‘Seven Drunken Nights’ which I had never heard before and had me roaring with laughter; a wonderful tribute to another departed band member Ronnie Drew. When they returned after the break they really got the audience on their feet and dancing with old favourites, ‘Dirty Old Town’, ‘Irish Rover’ and ‘Whiskey in the Jar,’ which at this stage had a large part of the audience showing off their Irish dancing skills down the front and jigging away as if their lives depended on it. You couldn’t help but smile at seeing so many people of all ages having such a good ‘craic’ and it made me secretly wish that I had some Irish blood in me. However, no matter, despite not being brave enough to actually get up and have a dance at the end of a great evening, myself and most of the audience were up on our feet, clapping away and demanding an encore. With a rousing rendition of ‘Wild Rover’ still ringing in my ears, I left The Dagenham Roundhouse in great spirits and really hope to be back there again soon. The Dublin Legends were the perfect choice to kick off what will I’m sure be a fabulous new era for the venue. This is a great venue with a warm heart and I wish George and his team all the best for the future.